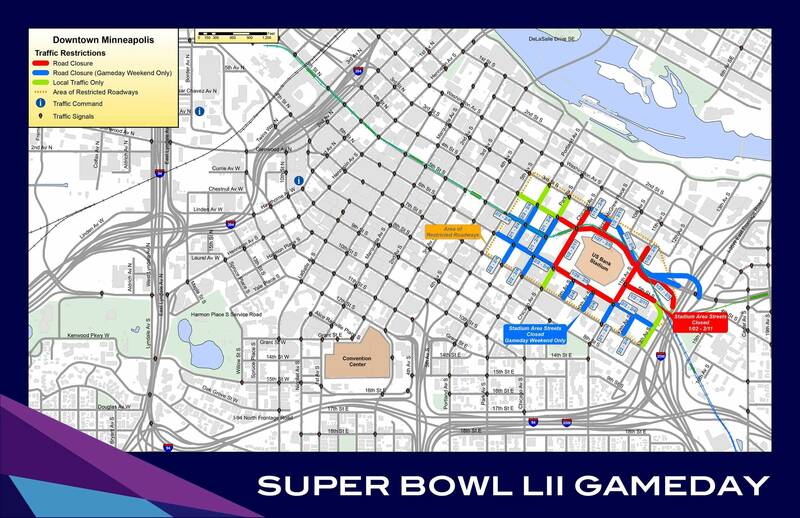 Streets around U.S. Bank Stadium will begin closing in early January ahead of the upcoming Super Bowl LII, with additional closures on game day weekend. Metro officials released plans for closures, expanded transit service and other logistics 83 days before the big game. "We are releasing this today to help Minnesotans and visitors plan ahead," said Minnesota Super Bowl Host Committee vice president of operations and logistics Kyle Chank on Monday. Roads to downtown businesses and Hennepin County Medical Center will narrow to two lanes where they cross Nicollet Mall. There will also be closures around the Minneapolis Convention Center. "It might make sense for folks to say, my normal trip is through one of these streets and they might decide I'm going to take a circuitous route just to avoid or lighten the load in these areas," said Jon Wertjes, director of traffic and parking services for the city of Minneapolis. Wertjes said road closures will affect one of the access routes to the Elliot Park neighborhood east of downtown. Metro Transit plans increased evening service and park-and-ride options for events. Fans can reserve downtown parking starting in mid-December. "Through the course of the week leading up to the Super Bowl we will be adding service, all-day service, from between four and nine different park and ride sites," Metro Transit general manager Brian Lamb said. Metro Transit anticipates 135,000 additional rides during Super Bowl week.